high-definition creative commons photographs from the Great Lake near Angkor in Cambodia, showing village life, fishermen and views of the lake itself, together with further information, a video and a map. The Tonle Sap (Khmer meaning Large Freshwater River), is a combined lake and river system of major importance to Cambodia. It is unusual because its flow changes direction twice a year, and the portion that forms the lake expands and shrinks dramatically with the seasons. Tonle Sap is the largest freshwater lake in South East Asia. From November to May, Cambodia's dry season, the Tonle Sap drains into the Mekong River at Phnom Penh. 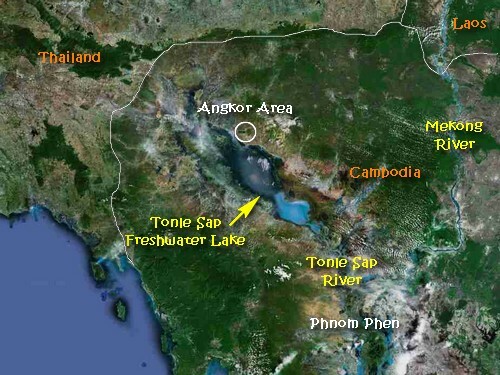 However, when the year's heavy rains begin in June, the Tonle Sap backs up to form an enormous lake. For most of the year the lake is fairly small, around one meter deep and with an area of 2,700 square km. During the monsoon season, however, the Tonle Sap river, which connects the lake with the Mekong river, reverses its flow. Water is pushed up from the Mekong into the lake, increasing its area to 16,000 square km and its depth to up to nine meters, flooding nearby fields and forests. In 1177 and again in 1178, the Cham invaded Cambodia. In 1178, they launched a surprise attack on the Khmer capital by sailing a fleet up the Mekong River, across Lake Tonle Sap, and then up the Siem Reap River, a tributary of the Tonle Sap. The invaders pillaged the Khmer capital of Yasodharapura and put the king to death. In the same year Jayavarman VII came into historical prominence by leading a Khmer army that ousted the invaders. Many of the bas-reliefs on the Bayon Temple, built by the King, illustrate this important battle which took place partly on Tonle Sap.